A couple of weeks ago we held the latest Yammer Hack Day at Yammer HQ. Hack Day comes around a few times a year at Yammer and provides people a chance to work on things they really want to work on for 2-3 days. Many people hacked on things unrelated to Yammer as well as many choosing to hack on our API and other aspects of the service. For me, I decided to hack on something a bit different. I decided I wanted to hack the physical space by opening a cafe inside the office for the three days. Also, I really just wanted to scratch my own itch and have a try at making great coffee! On the first morning, I set up the Rancilio machine I’d borrowed from a colleague and then the grinder we’d borrowed from the excellent Joy Ride Coffee. I had trouble getting the machine going – let’s just say that my cafe, lovingly named ‘150ml’ in celebration of the metric system, had to turn many customers away on the first morning of hacking. Quickly, I ran over the road from our office to my normal coffee haunt, Ma’velous to seek their wisdom. There, they gave me a quick lesson and one thing stood out to me. 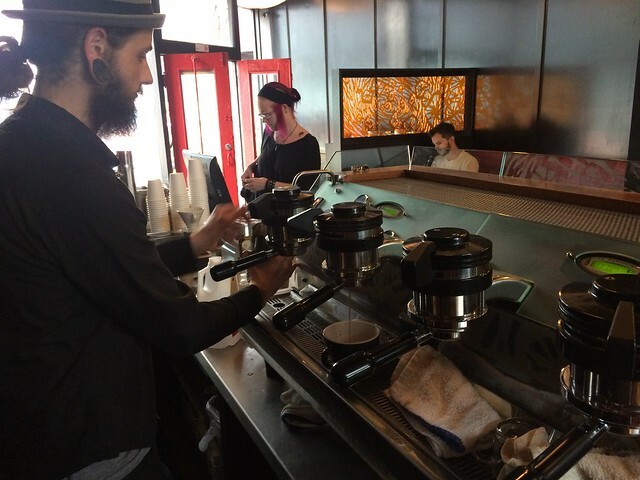 When you’re making coffee, you may see people time how long it takes for the espresso to get made from the machine. From the point the barista presses the button and starts exposing the ground coffee in the portafilter to pressurised water, to when you stop it, is ideally about 23 seconds. Easy, I thought. Put the coffee in the portafilter, whack it into the machine and then start timing and press stop at 23 seconds. Not quite. The folks at Ma’velous taught me that you actually want to stop the machine when the water changes from the rich, brown ‘coffee’ colour to be more ‘blonde’ in colour. It’s at that point you stop it. “So why 23 seconds?” I asked? They informed me that was to calibrate the grind of the machine – mostly. You don’t measure how much water you put through by seconds. Instead you calibrate how finely you’ve ground the beans by seeing how long it takes for the espresso to come through. So, if the coffee changes to a more blonde colour at around 13 or 14 seconds, it means your grind it a bit off. There’s a lot of subtlety in all this and I don’t feel like I’m quite doing it justice in this post – It’s my first for a while – but generally I’ve thought a lot about that since. It’s so easy when given a clear metric, like time, to manage towards that. It’s left me thinking a lot about other measurements and how they provide the opportunity for calibration in other areas rather than directly changing expected behaviour – like letting the water run until 23 seconds each time and pouring a sub-par coffee each time.